Wednesday – AUS – Consumer Price Index rose 0.5% in the December quarter, slightly above expectations. The annual rate of inflation eased from 1.9% to 1.8%, well below the RBA’s 2-3% target band. Wednesday – US – Federal Reserve Interest Rate Decision – Interest rates remained unchanged at 2.25% - 2.50%. 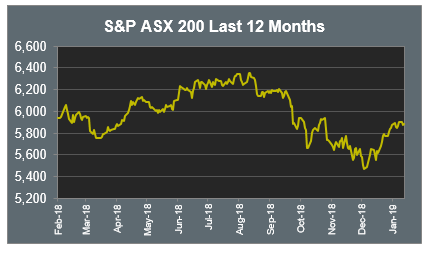 The Australian sharemarket rose 0.2% yesterday, led by the Materials sector. Commodity prices advanced in response to comments from US Treasury Secretary Steven Mnuchin, who suggested the prospect of a truce in the trade war with China. Mining heavyweights Rio Tinto and BHP gained 4.5% and 2.6% respectively. The Financials weighed on the market, with the big four banks all lower. ANZ led the losses down 0.4%. The banks were barred from reading the Royal Commission final report until it is publicly released after the market close on Monday, amid concerns over possible trading of insider information. The Australian futures market points to a 0.31% rise today, being driven by strong overseas markets. European sharemarkets were mixed on Wednesday. Luxury goods retailers rose following a positive earnings report from Moët Hennessy Louis Vuitton which rose 6.9%. The broad based STOXX Europe 600 rose 0.4% and the UK FTSE 100 lifted 1.6%, while the German DAX lost 0.3%. US sharemarkets were strong overnight in response to positive earnings reports and the Federal Reserve interest rate decision. The S&P 500 lifted 1.6%, the Dow Jones rose 1.8% and the NASDAQ climbed 2.2%. Shares in Boeing rose 6.3% on positive full-year profit guidance, with commercial airplanes revenues up 12% to $17.31bn. Apple rose 6.8% after reporting solid services revenues, up 19% year on year, total revenue reported for the quarter was $84.31bn. eBay rose in after hours trade, up 1.16% after reporting in line revenues for Q4. Yesterday’s release of Australian economic data confirms inflation continues to be subdued. The annual pace of inflation held at 1.8% and remains below the RBA’s 2-3% per annum target band. The low inflation environment is reflective of conditions in the labour market and retail sector. Wages growth is low and, although the unemployment rate has declined over the past year, there remains spare capacity within the labour market. 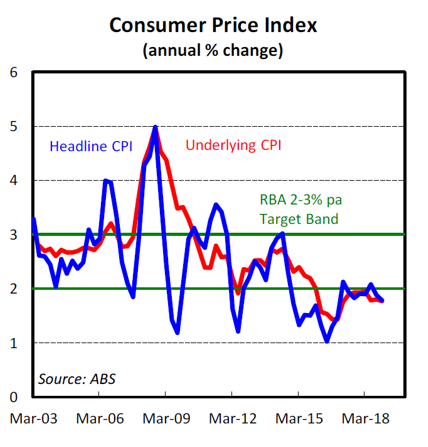 Inflation looks set to remain under the target band for some time and be a factor that keeps the RBA on the sidelines, as far as interest rate hikes are concerned. Unless there is a dramatic change in economic conditions to encourage inflation, there seems more case for a rate reduction by the RBA, than a rate hike.